When Mama spots a wishing star, she asks for "world peace-ah..ahh...ahh-CHOO!" World pizza? Suddenly across the globe yummy pies of every kind come drifting down from the sky. That's not exactly what Mama hoped for before she sneezed... or is it? This is one simple yet extremely clever piece of literature. You can tell just from the front cover that you are about to read something special. 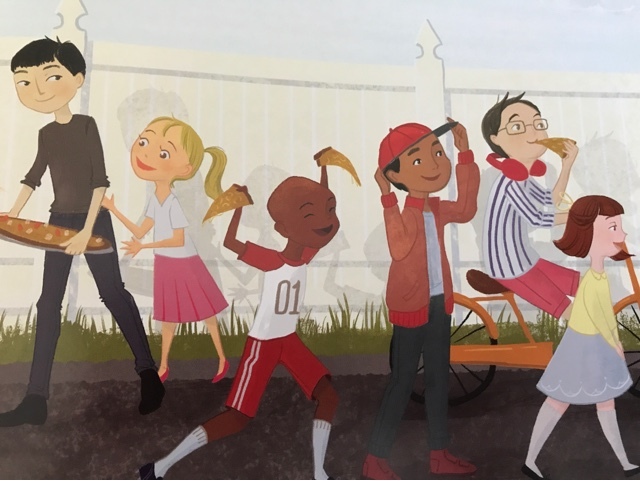 The illustrations are of well pizza of course and lots of children, all of different races and colours, immediately appealing to the masses as you can see that it will be diverse, open minded if you will. The story begins with Mama wishing on a star, what she would like is world peace, something many of us are constantly striving for. The trouble is mid-wish Mama happens to sneeze and it ends up sounding like what she actually wished for was world pizza, this immediately had my five year old laughing. I asked her what she'd wish for if she had the chance and her reply was simply cake, which made me chuckle. Mama in her hear, still wished for peace, for a world filled with kindness and love and no fighting. I took this opportunity to discuss these sorts of things with my daughter. I asked her how she was kind and her first thoughts were to offer hugs and kisses and then when I said to think about how she's kind to her friends, her answer was to share. A concept that actually many of us even in adulthood fail to use. 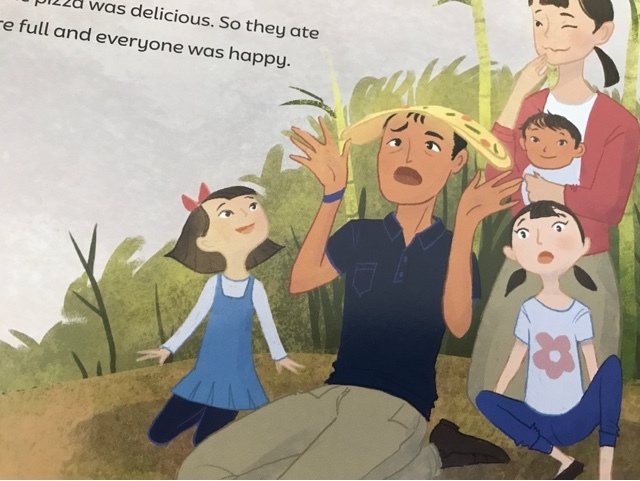 As the book progresses we see pizza literally falling from the sky, and not just your bog standard cheese and tomato, oh no all sorts of flavours were making an appearance. My personal favourite pizza topping has to be meatballs and barbecue sauce. There was spicy pepper pizza, salty seaweed pizza, chocolate cherry pizza, and extra cheesy with pickles pizza. But something miraculous was happening as these pizzas found their way to the people below, Mama's wish was coming true.... There was kindness being shown to unlikely people, arguments ceasing because who wants to fight when there's food to be eaten, happiness was spreading, who knew pizza could be such a powerful thing. So what did we learn. Well world pizza could really mean world peace. 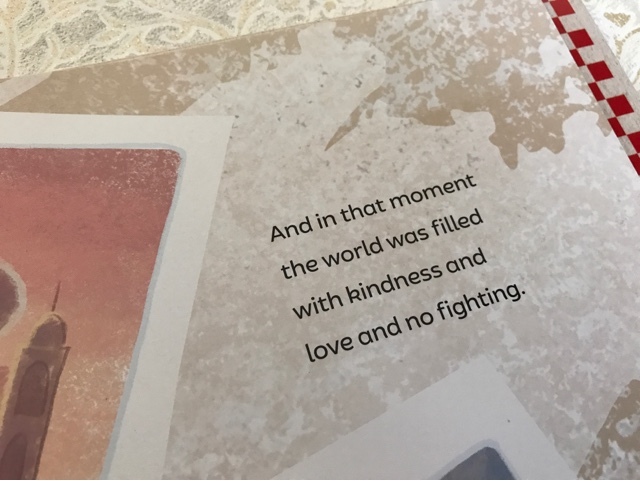 This book teaches so much, showing how to share, how a simple act of kindness like sharing a slice of pizza can change a persons mood, spreading joy instead of sadness and there's something else that this book does.... make me crave pizza, I know what I'll be having for dinner tonight! What a lovely book. I laughed at World Pizza instead of World Peace as well! What a fab book., cleverly thought up. 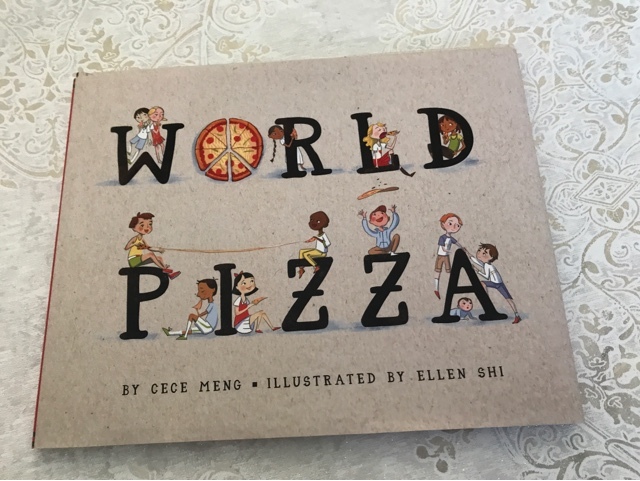 Pizza is my boys favourite meal, so I know they would love this book.